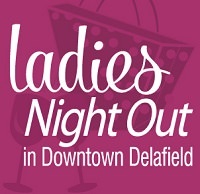 Mark your calendars for next Ladies Night Out events in downtown Delafield. There will be 3 Ladies Night Out evenings: The second Thursday of October, November and December! This is a great opportunity to get together with your girl friends, sisters, cousins & or mom for a fun night of shopping, dining and "wine-ing"! Each month participating businesses will be open until 8:30pm and will offer a very special "Deal of the Night!"